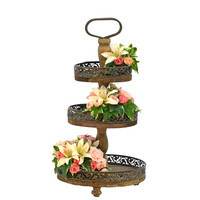 Welcome to Frou Frou Flowers! Do you need stunning floral arrangements for your business without the daily hassle and expense of real flowers? 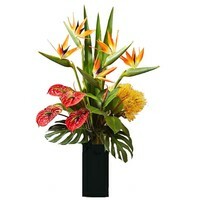 Looking for long lasting floral displays that match your brand and enliven your corporate space? 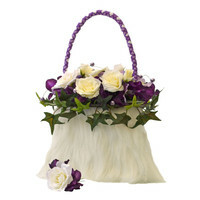 Frou Frou Flowers has the solution: silk flower arrangements! Click here to see what Frou Frou can do for your business! Marian het Lam-Minekus is owner and founder of Frou Frou Flowers. 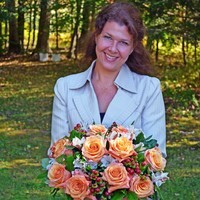 She is an Advanced Dutch Floral Designer and Wally Klett Wedding Specialist. ...to use silk flowers: Money saving, easy to care for, availability all year round, more colors and better for allergies. Frou Frou Originals are creative silk floral objects, unlike anything you have seen before, all designed and handmade by Marian. Frou Frou Treasures all have a base that is found on tag sales, flea markets and antique shops. Marian turned them into a unique silk floral object! 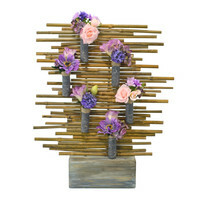 Variety is now possible with silk flowers! 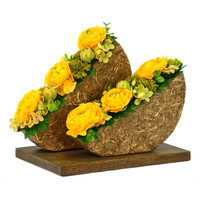 With FlexiFlowers you buy a handmade base with one set of silk flowers. But because of the special design you can easily replace the original set of silk flowers with another set with a different color or style (sold separately). You can even use the empty aquatubes, which are included, to make your own fresh flower arrangement! Looking for unique bridal flowers? Marian can make astonishing bridal bouquets with matching boutonnieres, corsages, bridesmaid bouquets and other floral arrangements. He also enjoys to make websites so if you like his websites (like this one) please contact us and he'll be happy to sit down and see what he can do for your website!